The more I learn the more I discover there is to learn – and this is particularly so with military bicycles.I recently purchased a Columbia frame and sprocket that turned out to be a WW1 military model. While searching for parts to complete its restoration on http://www.thecabe.com forum, I met many other thecabe enthusiasts with shared interests who helped me a lot. As there is so little information in this area, we felt it was time to pool our data into a new forum military bicycle section. This section includes all military bicycles of all nationalities and wars. You can join the forum and create new posts with pictures of your own bikes, and with any information and questions. Because they were overshadowed by cars and motorcycles during wars, their usage was considered less important by historians. In the British Army, from the 1870s onward, various officers fought hard to get bicycle corps established, but were thwarted by the Cavalry division who saw the bicycle as competition. Similar issues were reported in the US military. By WW1, the development of motor vehicles had evolved sufficiently that bicycles were generally relegated to subsidiary tasks (though they still proved useful for silent reconnaissance duties). The Boer War (1899-1902) occurred before before motorized vehicles came into general use, so was the first and only campaign where bicycles were employed by both sides and undoubtedly proved their worth. 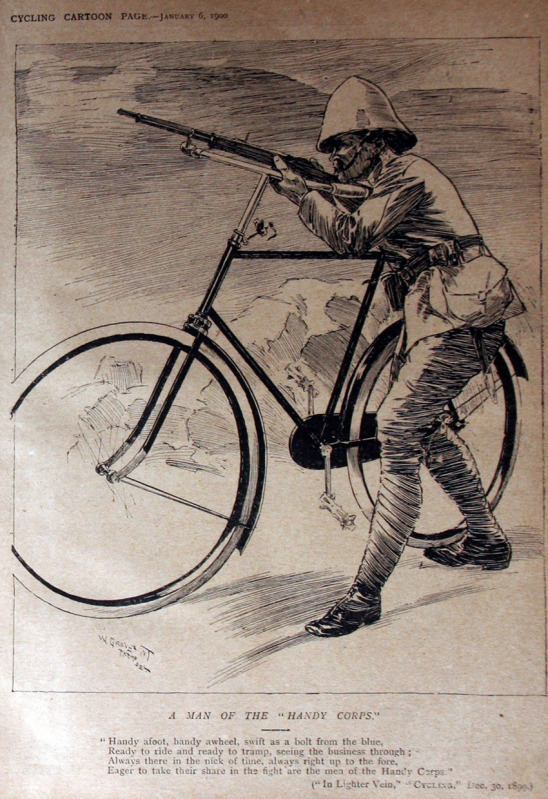 British bicycle troops in South Africa during the Anglo-Boer War numbered several hundred. There was much resentment against their use by the cavalry and, officially, they were mostly used for carrying despatches. But the cyclists always ready for other tasks; they were particularly effective for scouting and spying missions. A special ‘War Cycle’ was built for use on railway lines (above). It was introduced into South Africa by the Royal Australian Cycle Corps and had a detachable rim which was fitted to the pneumatic tyres, enabling it to be used on rails. When the rim was removed the bicycle could be used on normal roads. These cycles were used for reconnaissance, for carrying despatches, checking the railway line for demolition charges, and also for removing the wounded from a skirmish taking pace near a railway.